Prof. Dr. S M Mahabub Ul Haque Majumder, Pro- Vice Chancellor of Daffodil International University addressing the Meet The Press on ‘Daffodil International Model UN Conference 2019 (DaffodilIMUN'19)’ held today at 71 Milonayoton of the university. 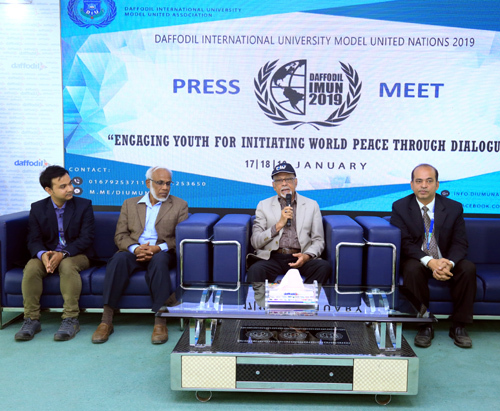 3-day conference of ‘Daffodil International Model UN Conference 2019 (DaffodilIMUN'19)’ with a theme "Engaging Youth for Initiating World Peace through Peace Dialogue" is going to be held from 17th-19th January, 2019 at Daffodil International University. Mr. M. Humayun Kabir, former Ambassador of the People's Republic of Bangladesh to the United States has given consent to inaugurate the seminar as the chief guest on 17th January. Ms. Nahida Sobhan, Director General of UN Wing of Ministry of Foreign Affairs Bangladesh will present as the special guest. About 250 students delegates are participating nationwide and internationally in this seminar. And they will participate through 8 different committees. The committees are: United Nations Security Council (UNSC), UNDP, UNHCR, UNICEF, IMF, SCBA, JCC and UNNC. All these information were declared through a press conference held today on 15th January, 2018 at 71 Milonayoton of the university. The Meet the Press was addressed by Prof. Dr. S M Mahabub Ul Haque Majumder, Pro- Vice Chancellor, Prof. Dr. Golam Maowla Choudhury, Mr. Md. Anowar Habi Kazal, Senior Assistant Director (PR) and Senior Lecturer Rafi Al Mahmud, Moderator, Daffodil International Model UN Association. The press conference also announced that Professor Yousuf Mahbubul Islam, Vice Chancellor, DIUwill present in the closing ceremony as thechief guest while Prof. Dr. S.M. Mahbub Ul Haque Majumder, Pro Vice chancellor, DIU will as the Guest of honor. Professor Dr. Mostafa Kamal, Dean, Permanent Campus of DIU and Professor Dr. Farhana Helal Mehtab, Associate Dean, Faculty of Humanities & Social Science will present as the Special guest. This conference will be hosted by Daffodil International University Model United NationsAssociation associated by strategic partner UNYSAB and knowledge partner UNIC, Bangladesh.Media Partners are Somoy Television and The Financial Express. While addressing as the chief guest Professor Dr. SM Mahbub Ul Haque Majumder said that there are lots of crisis prevails in the world. Young people are playing vital role and contributing to solve these problems. Youths always raise their voices about world’s problems and find out a solution through this Model United NationsAssociation. This is a unique organization where students are acting as a committee as like as United Nations. He expressed that young participants of the conference raise their voices and contribute to establish world peach.